Here's a different spin on it..."your husband says to buy anything you want"...my answer is.."ehh, yeah, you got that right". I will. and I do. My husband says he just says things to convince himself he's in control...but he knows better. Now that's a smart husband!! 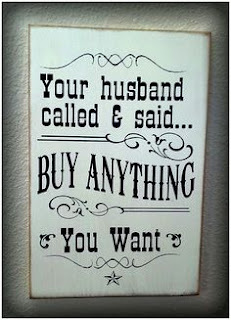 And as for..."spend all his money".....you got that right! I'm SAVING MY MONEY!! for myself. So...let's spend all of his...that's what he's working for anyway, right? "Happy Wife, Good Life". Don't let these sayings upset you too much...take the offense, not the defense. Men...pfffttt....can't live with them...can't kill them. Hope you feel better. Enjoy your day! I don't take offense, because it's just words. Don't let someone else's words have sway over you. What I do take offense at, and maybe I shouldn't because I am not clear on your meaning, but what does the political arena have to do with this? If you are trying to infer that one political party over the other is fueling this sentiment, I am not sure I get that idea. So instead of putting words in your mouth I am going to not let what I think you mean cause me to react. That's the ultimate power. Don't react. And if you can't keep from reacting, maybe you need to determine why you allow these quips to push your buttons? I feel weird about money because I'm not working and Husband is.....but I'm the one with the inheritance in the bank. If I'm going to spend a buttload of money on somewhat frivolous items (i.e., yarn), I'll probably discuss it with Husband first (and do what I want anyway), just as if he's planning to buy something somewhat frivolous (like a fancy movie poster or electronics), he'll discuss it with me first (and do what he wants anyway). I'm with you - I see stuff like that and it's just like COME ON. What century are we in? The subtle implications with stupid signs like that are really frustrating. Men are not always the breadwinner these days, quite often they make the same as their partners, or their partner makes MORE. And yeah, there are still people who are in a more "traditional" situation financially, and who am I to judge? It's not my reality, and it's also not my business. Signs like this make me think of that weird annoying dude who thinks he can call me baby even though he doesn't know me, or who tells me to smile because obviously I'm just an ornament walking down the street and I'm there to make him feel better about his boring life. They speak to the underlying sexism that colors so much of our society still. Unbelievably, in the face of all reason. Yeah, it's a joke - but there are a lot of jokes that don't stand the test of time (the era of comedians doing blackface seems like a pretty good parallel here). This is one of them.